Buckley AFB, looking west with the Colorado Rockies in background. Aurora is in foreground. 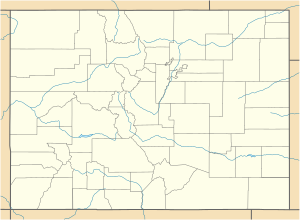 Buckley Air Force Base (IATA: BFK, ICAO: KBKF, FAA Location identifier: BKF) is a United States Air Force base in Aurora, Colorado, that was established by the U.S. Army in 1943. The base was named in honor of World War I Army pilot 1LT John Harold Buckley. Buckley Air Force Base is an Air Force Space Command base that serves more than 92,000 active duty, National Guard, Reserve and retired personnel throughout the Front Range community. Buckley AFB defends America through its air operations, space-based missile warning capabilities, space surveillance operations, space communications operations and support functions. The mission of Buckley Air Force Base's host unit, the 460th Space Wing is to deliver global infrared surveillance, tracking missile warning for theater and homeland defense and provide combatant commanders with expeditionary warrior Airmen. The 460th Space Wing is broken into three groups, each responsible for a distinct part of the Buckley Air Force Base mission. Provides missile warning, missile defense, technical intelligence, satellite command and control, battlespace characterization and robust communications. The group's team of space professionals operates the Defense Support Program satellite, which provides continuous global surveillance, tracking and targeting. Provides trained personnel to support the Air Expeditionary Forces and Homeland Defense. The group is responsible for force protection, quality of life, human resources, contracting, logistics, base infrastructure and environmental stewardship support to the 460th SW, its customers and the base operational missions. Supports military readiness to the Air Expeditionary Forces and Homeland Defense missions by ensuring base personnel are medically qualified for deployments and providing health care, life skills support, family advocacy, aerospace medicine, public health, bioenvironmental engineering, optometry, ancillary services health and wellness services and dental care. The base also hosts the Colorado Air National Guard 120th Fighter Squadron and its F-16C fighters, the 140th Wing also includes the Air Mobility Command's 200th Airlift Squadron, operating the C-21 Learjet; the Air Force Space Command's 137th Space Warning Squadron; and the Pacific Air Forces's 240th Civil Engineering Flight. Air National Guardsmen of the Colorado Air National Guard provide services during national emergencies or wartime and natural disasters. The Colorado Air National Guard is an integral part of the Operation Noble Eagle mission responsible for the 24-hour-a-day defense of the land, sea, and air of the United States. The ANG's state and federal mission is to provide trained, well-equipped men and women who can augment the active force during national emergencies or war, and provide assistance during natural disasters and civil disturbances. The guard plays a significant role in the Noble Eagle mission responsible for 24-hour defense of the land, sea and air of the continental United States. The Colorado Army National Guard operates the Army Aviation Support Facility at Buckley AFB and is responsible for supplying personnel and equipment for CH-47 Chinook, UH-1 Huey, and UH-60 Blackhawk helicopters. 77 tenant units call Buckley AFB "Home". The Aerospace Data Facility, the 140th Wing, 566th Intelligence Squadron, Air Force Office of Special Investigation, Det. 801, Marine Air Control Squadron 23, Navy Marine Corps Reserve Center, U.S. Army Corps of Engineers, Civil Air Patrol, Army Air Force Exchange Service, Air Force Audit Agency, Air Force Operational Test and Evaluation Center, Air Force Technical Applications Center Det. 45, Defense Commissary Agency, Defense Contract Manager Agency, Army Aviation Support Facility and Battery A, 1st Battalion, 14th Marines. The Air Reserve Personnel Center (ARPC), which was physically located off Buckley at the former Lowry AFB in Denver until it relocated into a new facility on base, 1 Aug 2011. ARPC manages personnel records for the Air National Guard and Air Force Reserve Command and maintains the virtual Personnel Center - Guard and Reserve, a Web-based portal for Air Guardsmen and Air Force Reservists. With over 490 military and civilian personnel, ARPC also performs other personnel services and transactions in support Air Reserve Component forces in the continental United States, as well as Alaska, Hawaii and Puerto Rico. The 4th Manpower Requirements Squadron, Air Force Accounting and Finance Office, Defense Information Service Agency, Air Force Institute of Technology, Air Force Office of Special Investigation, Det. 110, Air Reserve Personnel Center, Defense Automated Printing Service, Defense Security Cooperation Agency (FMS), SBIRS Combine Task Force, HQ Air Force Weather Agency, ROTC Det. 105, Department of Defense Inspector General, Military Entrance Processing Station, Naval Reserve Recruiting Area West 7, Rocky Mountain Arsenal and the U.S. Army Recruiting Battalion. In addition, a $141 million facility for the National Security Agency is planned on the base, which will provide space for 850 people whose offices are now in temporary buildings. Buckley is home to a large contingent of secretive agencies, including the NSA and the National Reconnaissance Office; the Aerospace Data Facility-Colorado; Army, Navy, Air Force and Marine intelligence and information units; and Marine and Coast Guard cryptologic units. During the early years of World War II the city of Denver purchased a 5,740-acre (23 km2) parcel of land several miles east of the city and donated it to the Department of the Army. The site was named Buckley Field after 1st Lt. John Harold Buckley, a Longmont, Colorado, native, who was killed while on a combat strafing mission behind enemy lines in France on September 17, 1918. Under the command of the 336th AAF Base Unit (Army Air Forces Technical Training Command), construction on this air base began in early 1942, and that resulted in the construction of over 700 buildings. On 1 July 1942, the U.S. Army Air Corps Technical Training School there opened. It consisted of bombardier and armorer training for aircrewmen on the B-17 Flying Fortress and B-24 Liberator bombers. During WWII, Buckley Field also trained over 50,000 airmen in initial basic training. With WWII over, Buckley Field's military role quickly diminished, and in 1946 it became an auxiliary field of the nearby Lowry Air Force Base. Lowry in turn transferred control of the base to the Colorado Air National Guard that same year. Air National Guard ownership lasted less than one year, and then in 1947 the Department of the Navy took charge of the base and renamed it Naval Air Station Denver. The renamed base was the location of Naval Air Reserve aviation squadrons, as well as for veterans and their families waiting to return to civilian life. Thousands of veterans returned to civilian life here over the next four years, while Naval Air Reservists concurrently conducted operational training. The Navy remained here for 12 years before decommissioning its base on June 30, 1959, and transferring it back to the U.S. Air Force (which had not existed before 1947), which renamed the facility Buckley Air Force Base. However, the Naval Reserve remained at Buckley as tenant activity known as Naval Air Reserve Center Denver, the predecessor of the present day Navy Operational Support Center Denver. Buckley Field once again became the Buckley Air National Guard Base on April 18, 1960. At the same time, it became the first stand-alone Air National Guard base in the country. The Colorado Air National Guard remained in control of Buckley Field for the next 40 years, operating it as a fighter base. During the Cold War era, the Colorado Air National Guard mobilized the Buckley-based 120th Tactical Fighter Squadron for events as the Cuban Missile Crisis, the USS Pueblo crisis, and the Vietnam War. During the 1950s and 1960s, the growth of Aurora, Denver’s eastern neighbor, edged toward Buckley Field. The land of the air base was annexed to Aurora in 1965 and 1966; however, the installation is US Government property under Federal jurisdiction. Although the Cold War ended in the early 1990s, the 120th Tactical Fighter Wing did not see any decrease in its responsibilities. This Fighter Wing deployed from Buckley Field numerous times during the decade of the 1990s to take part in various military operations such as Operation Desert Storm, Operation Northern Watch, and Operation Iraqi Freedom. In October 2000, the Buckley Air National Guard base was transferred to U.S. Air Force control, and it was renamed the Buckley Air Force Base. Since the return of Buckley Field to the Air Force in 2000, the air base has seen an unprecedented amount of new construction and modernization. New enlisted airmen's dormitories, the commissary, the base exchange, and the fitness center have all been completed, augmented by the completion of family housing units - the first ones ever constructed at Buckley Field. "Buckley Air Force Base 2006 Guide". AQP Publishing Inc. This article incorporates public domain material from the United States Government document "Buckley Air Force Base". Wikimedia Commons has media related to Buckley ANGB. Buckley AFB Installation Overview from AirForceUSA.org.